When all students in the classroom have a laptop, tablet, or handheld computer at their fingertips, a whole new world of instructional possibilities appears. Get ready to tap those possibilities with Pamela Livingston's guide to 1-to-1 programs that work. You'll find practical planning advice, case studies of successful programs, and a host of implementation resources. Livingston updates this new edition with chapters on 1-to-1 leadership, tablet PCs, and the shift toward learner-centric educational environments. Also included in the new edition is a handy resource mapping the new Web 2.0 tools to various subject areas. 4-to-1 Learning has been written for administrators, teachers, parents, researchers, and anyone whose school or school district is considering a laptop program. It can also serve the needs of educators who work in schools or districts that already have a laptop program but want to see what other schools have done and are doing. 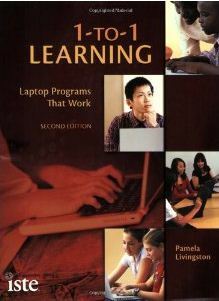 This book provides teachers with dozens of real-world stories describing how laptops have been used to transform teaching and learning. Patents can discover how students use laptops to deepen their learning and expand their horizons. Administrators will find the sections on planning, professional development, and logistics particularly useful as they steward their own laptop programs. Anyone considering a laptop program will find a host of anecdotes, ideas, lessons learned, and challenges overcome, each of which will be helpful as decisions are made. KB IB clear ENpS 3: Wer finanziert, wem gehören die Notebooks? Beat hat Dieses Buch während seiner Zeit am Institut für Medien und Schule (IMS) ins Biblionetz aufgenommen. Beat besitzt ein physisches, aber kein digitales Exemplar.